Agora Incorporated operators of GEPR, broadcast video content on the Agora Channel. 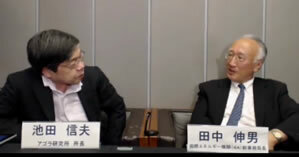 On May 17, it broadcast a dialog on the theme of energy policy and the shale gas revolution between former Executive Director of the International Energy Agency (IEA) Nobuo Tanaka and Director Nobuo Ikeda. Mr. Tanaka was an official in the Ministry of Economy, Trade, and Industry, and served as Executive Director of the IEA through 2011. Currently, he is a special adviser to the Institute of Energy Economics, Japan. He is an expert on the analysis and formulation of energy policy with an international perspective. The topic of the discussion was the current massive changes in the circumstances surrounding the world's energy in terms of the global economy as well as geopolitical aspects caused by the development of the shale gas revolution. Mr. Tanaka characterized Japan's current situation in which nuclear power generation has been suspended resulting in a dependence on fossil fuel power plants to meet energy needs as one of "elevated risk on the supply side." He advocated the importance of taking a broad, global view when considering energy issues, saying, "When considering the impact of the shale gas revolution, we must examine the diversification of Japan's energy supply." For details, see the article "Are we not forgetting about energy security? — The impact of the shale gas revolution — a summary of Nobuo Tanaka's statements"(in Japanese). In an audience survey, the majority described it as "very good" (76.9%) or "good" 13.6%, with many expressing the opinion, "I want to hear more of this kind of discussion." This may indicate that necessary information on energy is not being provided. The shale gas revolution became publicized around the world through “World Energy Outlook 2011 – special report: Are we entering a golden age of gas?”　released by the IEA while Mr. Tanaka was Executive Director. Two years later, "Our predictions have become a reality, and it has started to produce a wide variety of effects," said Tanaka, giving examples of the changes. ▼ The price of gas in America is falling due to the increased production of shale gas. In addition to the immediate effect of improving the balance of trade and bolstering the dollar, the manufacturing industry is returning to the United States with a focus on low energy prices. This has had the effect of suppressing global prices for gas and coal. 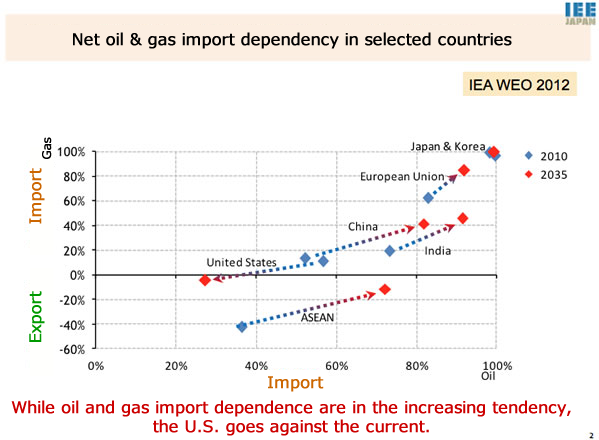 There is also the possibility that America will become an exporter of natural gas in the near future. These changes surrounding the shale gas revolution are occurring in a chain reaction, and how to deal with them has become an important question regarding energy issues in nations around the globe. However, since the Fukushima nuclear disaster of 2011, Japan has discussed little more than what to do about nuclear power. Ikeda pointed out, "It is ridiculous to focus on the single point of nuclear safety in concerns about energy issues." Japan is a nation poor in natural resources, and must think about not only safety, but how to procure a stable and inexpensive supply of energy in order to sustain its quality of life and industrial capacity. Following the disaster, Japan shut down its nuclear power plants and has increased power generation from natural gas in their place. The added cost is expected to reach ¥ 3.8 trillion for fiscal year 2013, and ¥ 9.3 trillion for the three years since 2011. Both men agreed that "if this continues, it will bring about a critical situation for the economy." On May 15, the Nuclear Regulation Authority released a report on the presence of an active fault below the Japan Atomic Power Company's No. 2 Reactor at Tsuruga Nuclear Power Plant. As a result, practically, the said nuclear power plant cannot continue operation. Tanaka said, "While it is a matter of course to seek safety, is not a measured response required regarding whether or not the determination of the presence of an active fault is scientifically valid?" He continued, "While it would be difficult in the current circumstances, immediately after the accident, they could have considered closure and replacement of old nuclear power plants with problems as a policy." 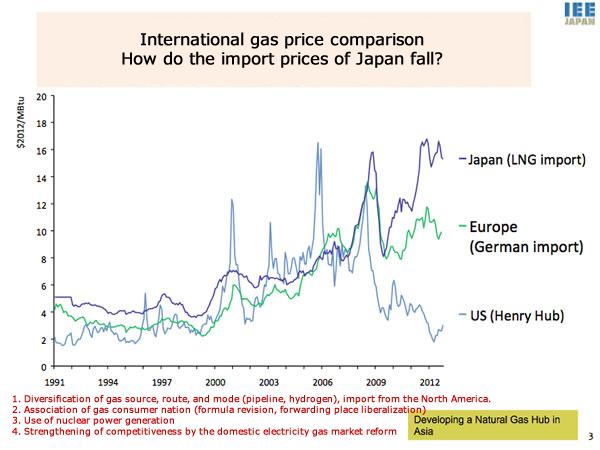 As Japan must transport natural gas by sea in its liquid state, this also adds to the cost. Sellers in the Middle East offer prices linked with oil, also increasing the cost. This is due to the inability to come to grips with the new method of pricing caused by the plunge in American gas prices and the need for Japanese energy companies to procure large amounts of fuel due to the suspension of nuclear power generation. "Efforts are needed to bring prices down. In order to do so, gas suppliers must be diversified, there must be more energy options, including nuclear, and the government and industry must cooperate in negotiations," said Tanaka. The response to expanded risk is "the pursuit of diversity"
Since the disaster, Japan's energy supply is slanted toward fossil fuels, accounting for more than 90% of total energy production. This is almost identical to the energy production composition prior to the first oil shock. 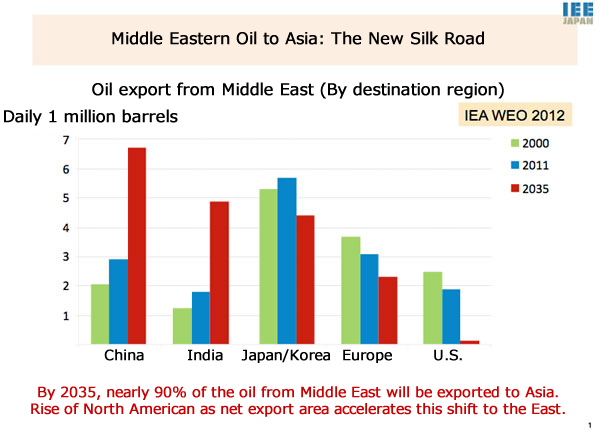 Japan depends on the Middle East for 80% of its crude oil imports, and 30% of natural gas imports. There are rumors of a possible attack by Israel over nuclear facilities in Iraq. In the theoretical event of war, closure of the Strait of Hormuz to maritime traffic by Iran could result in the devastation of Japan's economy via an oil shortage brought about by unpreparedness. "It is not unthinkable; it is a potential risk," said Tanaka. "We must be prepared for a worst case scenario." 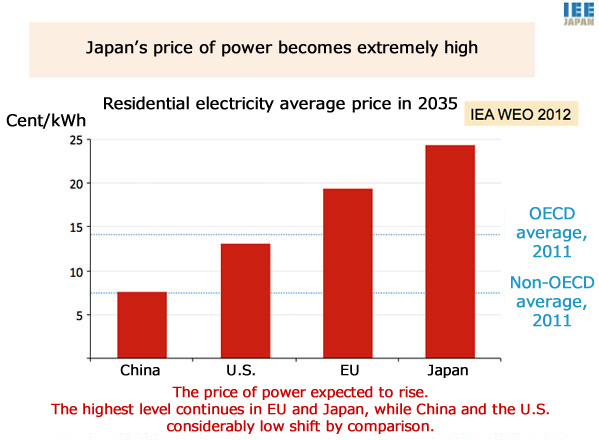 What course should Japan's energy policy take? Tanaka concluded by quoting former Prime Minister of the United Kingdom Winston Churchill on energy supply, "Safety and certainty in oil lie in variety and variety alone." He called it "a precept even today." People involved with energy must always consider the diversification of supply and the means of provision. There is a variety of types of fossil fuel such as natural gas, oil, and coal. In addition to these, there are also nuclear energy and renewable energy. Then there are methods of reducing usage through energy conservation. Tanaka emphasized, "Pursuing a variety of options will lead to a stable supply and a stable quality of life for the people of Japan in the future." Ikeda said, "Energy is crucial to the point of calling it an essential part of life itself. Participation and careful discussion by the country is needed." Tanaka agreed, responding, "When thinking about energy, one must think about guaranteeing safety. These efforts preserve the lives of the people of Japan, and there are many things the country must do, so careful action and consideration are required." The world's energy situation is changing significantly due to the shale gas revolution. However, over the last two years, concern about energy issues in Japan has been overly directed toward just nuclear power. Perhaps the time has come that we must face these changes and address our energy issues calmly with a broad perspective.